Convert many popular image formats such as PNG, JPG, GIF, TIFF, PDF, EPS, PS, SVG... Supports all types of RAW formats from DSLR digital cameras. 1. Double-click the downloaded DMG (e.g. ImageConverter.dmg) to 'mount' it. 2. Drag and drop the iWinSoft Image Converter program into your Applications folder to launch the installation process. 3. You can now run iWinSoft Image Converter from your Applications folder, or drag the application to your dock for quick access. 1. Open the Applications folder and launch iWinSoft Image Converter. As the program is initially launched, the End User License Agreement will be displayed. Please click on Agree to continue to use the software. 2. You will be presented with 3 options as seen below. 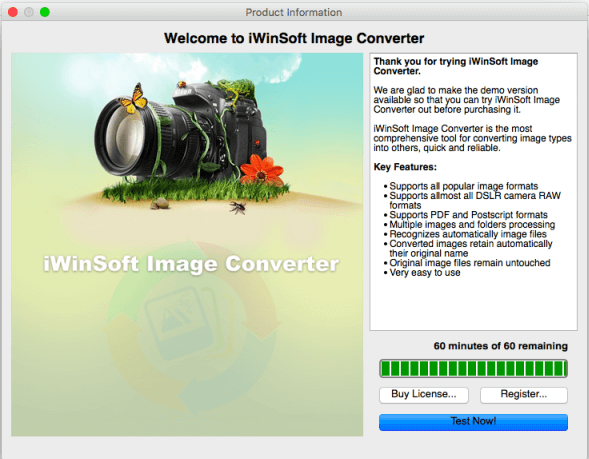 Click “Test Now!” to start the trial version of iWinSoft Image Converter. 1. After you purchase iWinSoft Image Converter, you will receive an email containing your “Serial Number and License Key” (sent to the email address you provide to Mycommerce, at time of purchase). If you do not immediately receive your Activation Key, please check your "Junk” or “Spam” email folders to ensure the email was not blocked by your spam filter settings. 2. Launch the Trial version of your software, and click on the “Register...” button. Step 1. Select the output format from the drop-down list. All image files you drop onto the app will be converted to that format until you change the format again. Step 2. Set the output folder. All converted images will be saved there. Or check "Use same as source". Then the results will be saved into the same folder as each original. Step 3. The Drag Area. 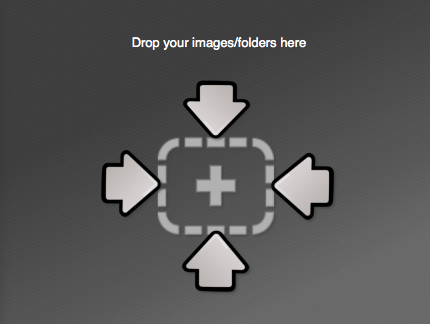 To convert images or whole folders drag your image files or folders from Finder into the Drag Area. Ready for macOS 10.12 & macOS High Sierra 10.13. Copyright © 2003 - 2019 iWinSoft Inc, All rights reserved. iWinSoft Inc. is a leader in innovative and easy to use software developer dedicating to the development and distribution of Barcode Generator and CD Label Maker. provides you complete bar code and label design and printing solution.